I remember weird things from my coma so here is the best I can place of what it was like to be in my medical induced coma. 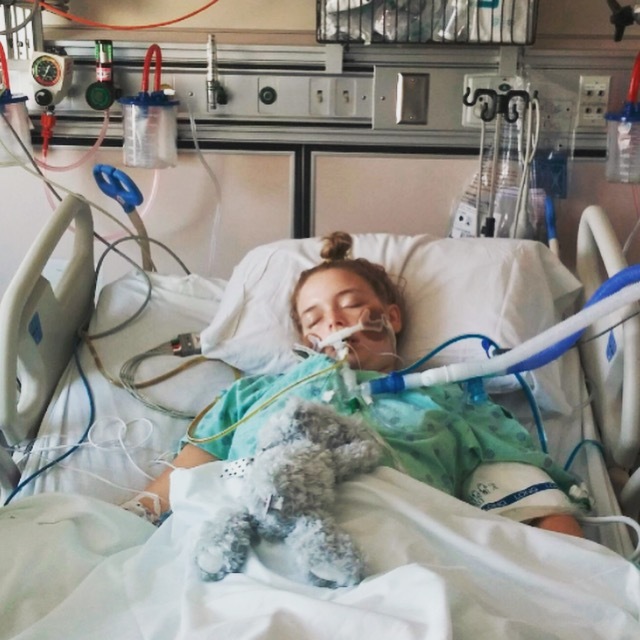 I was put into a medically induced coma on June 29th 2015 for about four days because I was having non-stop seizures and I was having brain damage from them. So here it what it was like for me… Right before I went into the first seizure I had a moment, a weird moment, of bliss like pure bliss everything felt okay, when I woke up again I felt like pure evil had run into my body and all I could think was I might not wake up from this. This might be what kills me..
That was the last time I was truly awake for a few days. So I remember a coffee shop, my dog Beng was there and sitting in my lap. My friend Macy was talking to me about eating pineapple popsicles, we talked about this for some times till I remember hearing Stephie talk and it was like I was somehow sitting in the car, it wasn’t her new car and Stephie was younger she was talking about work that day and we were driving in her old beat up car and the smell of summer was in the air, she was laughing and telling me about Rory, but she didn’t look like she does now. It was hard to place. But it all seemed nice. Another voice I didn’t know came into play, I didn’t know this person but Stephie whispered something in my ear. My feet were cold. I didn’t like that I wanted them to be warm. I kept thinking that, somehow my sister Stephie knew this and brushed my hair and I remember thinking as she brushed my hair and put pretty socks on me that I was safe, no I didn’t know what the socks looked like but I knew stephie and in my coma induced mine those socks were the bomb. When my papa’s voice came into play we were both in a bookstore with all of my favourite books, he was telling me about each little bird that sings and how I couldn’t be like the dog whose name he couldn’t remember. He told me I needed to come read a book with him. I asked him if he wanted coffee but he didn’t answer. I was sitting in the living room all the sudden all the lights were out and Tara sat in the chair close to me and screamed as the person on the TV jumped and the scary movie we watched played, she asked me how I wasn’t scared and how I was still hanging on. It felt nice and safe I smiled at her. She smiled back I somehow noticed Holly was sitting in the chair on the other side of the room, she asked me if I wanted anything. I tried to answer but I couldn’t.. I was sitting outside in the grass, my dog Dodie was sitting besides me and she licked my face, my friend AnnaJoh who looked like the last photo I had seen of her on instagram she asked me if I was hungry and I remember not being sure what to say. I felt foggy and the backyard was very dark. The stars seemed to dance as I laid down next AnnaJoh on the grass and looked out on the stars above. It seemed peaceful. “Shannon, Baby” I remember my mom was talking but i couldn’t find her, I was walking through a dark hotel as I heard my mom’s crying voice, I was looking through the hotel but couldn’t find the room she was in, I was trying to yell back but my voice wouldn’t come out. I walked into a room full of old movies and my mom sat in the corner and she said “Want to watch This movie?” I couldn’t tell what movie was play till I noticed it was Breakfast At Tiffany’s I smiled and sat down beside her, she had popcorn in her lap and I remember thinking that this was weird because I didn’t have a headache from the popcorn like I normally do. Gigi, who was the lady who gave me Beng sat besides me we were riding in her car and were talking about something it was sweet pure and simple, she asked me if i wanted to go back to her house or be dropped off at Stephie’s house. I told her i wanted to be dropped off at Stephie’s house. We drove for a long time. Talking about Dogs and about the earth and she kept repeating she was proud of me. She told me we had to make a stop before we went to Stephie’s house. The car stopped and she told me I could get out if I wanted to. I opened the door and Beng jumped out of the car and I followed him into a nice hotel room. My grandma stood in the kitchen cooking pork chops and turned around and said “You don’t have to have any anymore. You are brave my little Rose…” I smiled and sat down on a bar stool, my grandma rosa gave Beng some Pork chops and sat beside me. “How are you feeling?” I asked her she told me she was doing good and that the room serve wasn’t as good as she could cook herself she kissed me on the cheek and somehow I was being dropped off at Stephie’s house, Gigi said “I’ll see you soon,” and I go out of the car and Beng sat and looked at me. I opened my eyes to doctors talking to me I didn’t understand them at first and felt scared, I fall back to sleep. I remember stephie asking if I wanted to listen to Taylor Swift and the answer to that is always yes for sure!!! I have a weird memory of talking to my sister Vana, we were drinking coffee and talking about books is the basis of it..
Soa yea, that is the basis of my weird mind on insane medicine to save my life and that put me into a insane coma…. ← Thank You… No Really..